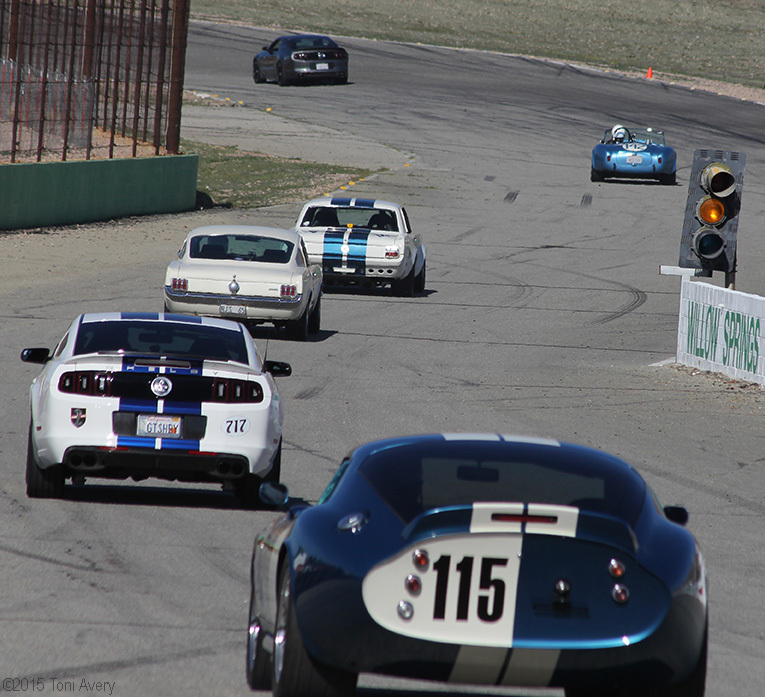 Willow Springs, CA welcomed an array of ponies on February 14, 2015, from vintage to hot off the production line. Owners brought out GT350s maintained in their original glory alongside a SEMA show car and other show queens modified to the extreme. Two prized cars drew the largest crowds in anticipation of what could have been. A pair of GT350s rebuilt to demonstrate what famed designer Peter Brock and the original Venice, CA crew from Shelby would have produced had there been more time and money in the budget. Each example may look identical but there’s one vital difference, the Independent Rear Suspension (IRS). This is something Brock and the crew were pushing for back in the day but budgetary restrictions and other issues prevented that from happening. The front bumper may also look different to GT350 experts. This was also another element Brock was finally able to implement. Even the square scoops toward the bottom of the bumper function better and work the way Brock and the crew always intended. 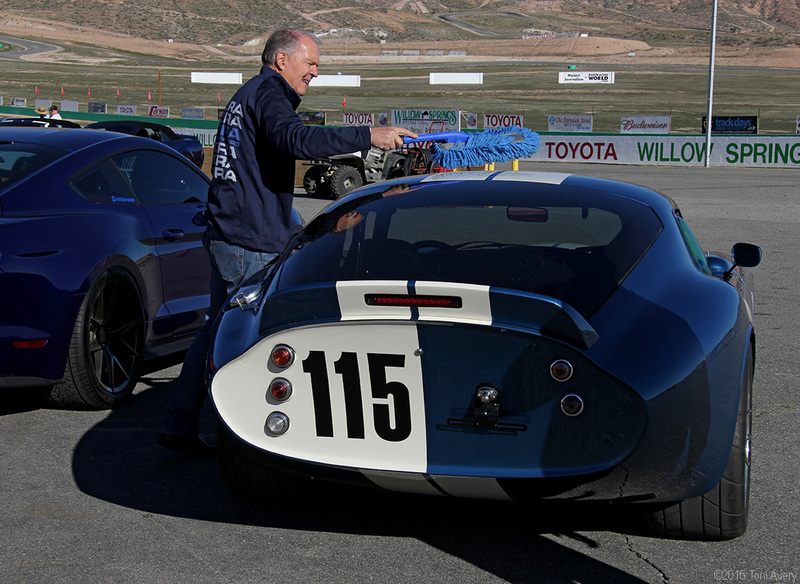 T: Where did you enjoy working more; Shelby or Datsun BRE (Brock Racing Enterprises)? P: Each era was probably the most fun because of what was going on in racing. I’d say they were equally enjoyable. Working with the Shelby crew were probably some of the finest workmen and when we started our own thing later several of those people came and worked with us at BRE. It was the continuity of different people and different cars. It was enjoyable all the way through. T: How did this new GT350 project come about? P: This was all Jim Marietta’s idea. He was one of the original crew members and decided that if we put the car together and rebuild it with a lot of the ideas that got discarded at that time either because of time or cost or marketing. A lot of the engineering ideas that were left over like the IRS, it was too costly at that time to put in and I wanted to redesign the front end on the car and redo the rear window. Just go back and do a few little details that I didn’t get a chance to work on at that time. T: Are these just an example of what could have been or are you building more to sell? P: I’ve already had three people ask if we could build cars for them. T: What’s in your garage and what would you still like to have in your garage? P: I’ve got my own Daytona Coupe, my wife’s got a BMW 2002; those are our two sporty cars. We’ve got a really beautiful 240Z that we just restored and then I’ve got what I call Godzilla, which is a 510 with a Chevy in it. Our daily drivers, mainly we use this F150 Pickup Truck, it’s an all-around great piece that we use and I’ve got a 1985 Mercedes Diesel that I drive when I need a sedan but most of the time we use the F150 Pickup Truck. It’s the most practical all-around vehicle we’ve got. T: What current automotive design do you like? P: It’s pretty tough to beat the new C7 Corvette. It’s probably not only a technical tour de force but they’ve done a beautiful styling job and everything on it works…there’s not a phony scoop on it. That’s what I appreciate most; those guys adhere to the honesty of the engineering. It’s just the best all-around car there is and for the money, there’s nothing in the world that will beat it. T: What advice would you give someone looking to get to where you are today? P: It would be a totally different path because the world of automotive has changed so completely, primarily because of electronics and also because of government intervention as far as safety. Right now we are in another great era of performance cars, which we never thought we’d see again…in the ‘70s we thought it was all gone but we’ve been able to make cars run cleaner. I don’t know if the electric car is ever going to get off the ground, there’s certainly a market for it for urban vehicles and that sort of thing. I still think the internal combustion engine has a long way to go in terms of development, in terms of space required for power. If you take a cubic foot of electric power and a cubic foot of, say diesel fuel, you’re going to go a lot further on diesel fuel than you will on electric power and a lot less weight. As clean as engines can run now they’re getting stuff coming out the pipe that’s cleaner than what’s going in so it’s hardly dead, the internal combustion engine. I may be a dinosaur but still love that sound. 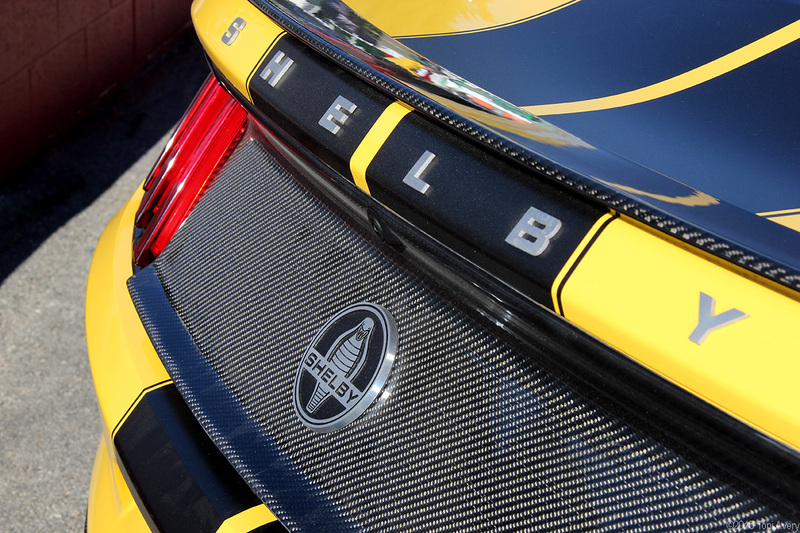 This event was like a candy store for Shelby enthusiasts and all-around car nuts. 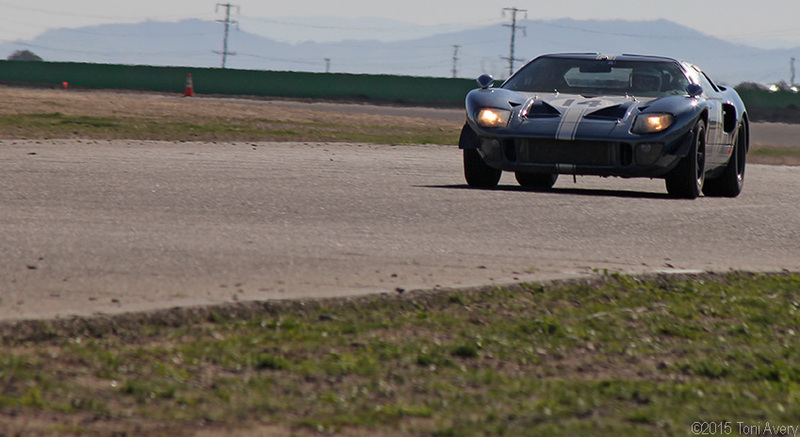 The car show was small with a select group of new and old Mustangs while the track welcomed all kinds of exotics from Ford GT40s to GT350s and even a Caterham 7. The main event everyone came to see was these two GT350s given the time and attention they deserved all along. Enjoy more photos below and be sure to check out the video above. Another good piece Toni. I appreciated what Pete said about the Corvette: “there’s not a phony scoop on it. That’s what I appreciate most; those guys adhere to the honesty of the engineering.” That’s quite a compliment from somebody who knows what they are talking about. 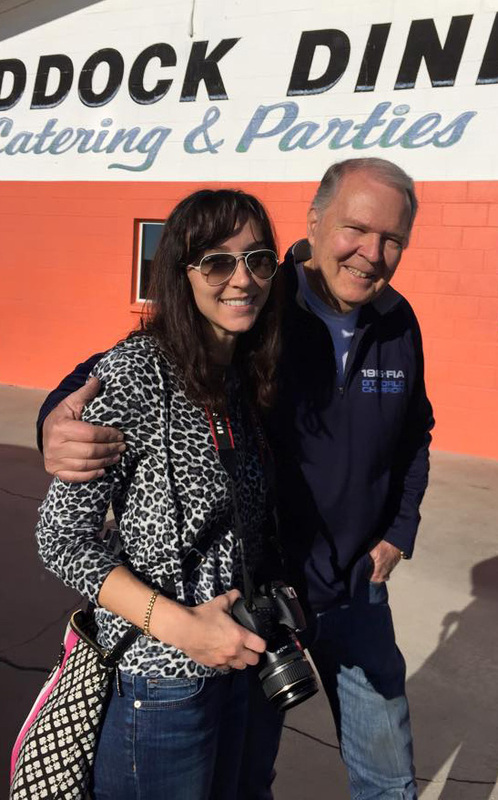 I’ve been able to chat with Pete a number of times, my favorite subject with him would be the 1959 Sting Ray Racer. His recent book “Corvette Sting Ray Genesis of an American Icon” is a great read. Thank you Paul! Peter was such a nice guy, glad you were able to meet his as well!